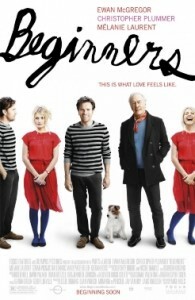 A romantic comedy about commitment phobia, Beginners succeeds winningly owing to sharp writing, self-consciously clever filmic devices (including a talking Jack Russell terrier – something that would ordinarily really bug the crap out of me, but here it had me laughing hysterically, as it’s really just a projection of the characters, like thought bubbles in a cartoon), and pitch-perfect performances by two actors who we already know are terrific — Ewan McGregor and Christopher Plummer – and the extraordinary discovery that is Mélanie Laurent (a French actress whose only other English-language film was Inglourious Basterds, but who has a promising career in Hollywood ahead of her, one suspects). McGregor’s Oliver is a graphic artist whose dying father, played by Plummer, comes out of the closet in his senior years, while Oliver struggles with commitment as a result of his parents having lived a lie during their four decades of marriage. Laurent’s Anna is equally damaged, thus rendering her the perfect match for Oliver. But how can two people, no matter how perfect for each other, stay together if they don’t know how? Therein lies the tension at the heart of this beautiful, modest film that cuts deep but leaves you smiling and somewhat hopeful. Award-winning cultural critic Seth Rogovoy is editor-in-chief of the Rogovoy Report (www.rogovoyreport.com) and BerkshireDaily and the official film blogger for the Triplex Cinema in Great Barrington, Mass.